If you don’t know what this mysterious and magical device is, yet, it basically allows for hands-off cooking and frees up a whole lot of time. 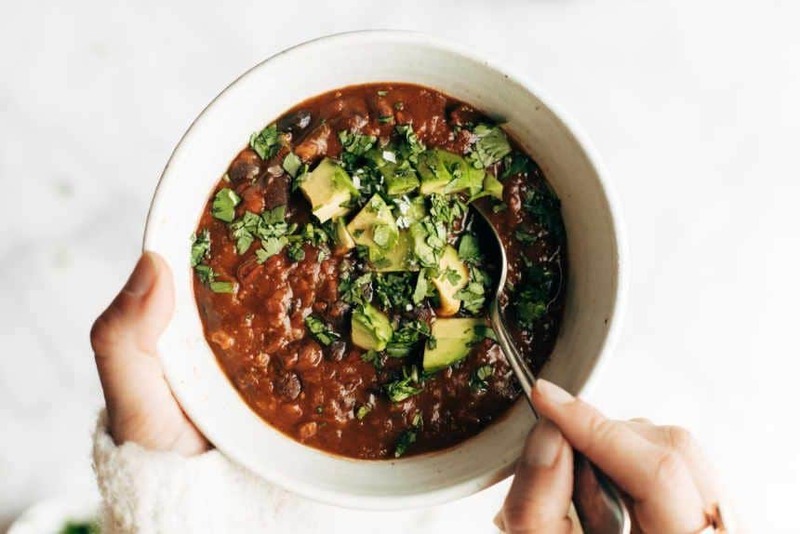 The electrical pressure cooker is super safe, preserves nutrients and flavor – and allows for whole grains or beans to be cooked from scratch in a pretty short amount of time. Click here to read more about the benefits, typical uses, and different versions of the Instant Pot in our in-depth article. There’s also a free downloadable guidebook with some insider tips and starter recipes! But let’s get back to these delicious concoctions for now. Even though the Instant Pot is such a helpful advice for vegans and plant munchers, the internet seems to love cooking everything from bone broth to whole chickens in it. That’s definitely not for us, so we took some time to gather 31 completely animal-free and vegan Instant Pot recipes. You’ll find that the most common uses here are some kind of stews and soups. Perfect for bean lovers (or those in the making), because there’ll be lots of different chilis, Indian lentil dishes, and even a Burrito. But there are also great Instant Pot breakfast ideas, make-ahead snacks, and even a whole cake. Say what? 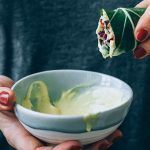 Since this is a blog on healthy plant-based eating, we want to mention that not all recipes here are super wholesome, and most of them call for some oil or sugar. Feel free to healthify these meals by omitting or replacing some ingredients. Let’s start with a true Instant Pot classic. A simple, healthy, super filling lentil curry with fresh ingredients like ginger and garlic as well as rich Indian spices. It gets its richness from coconut milk and won’t come out too spicy! Green or brown lentils work best for this recipe and don’t forget the finishing touch: a good squeeze of fresh lemon. Dinner won’t get much more inexpensive than this! Calling all simple meal lovers! 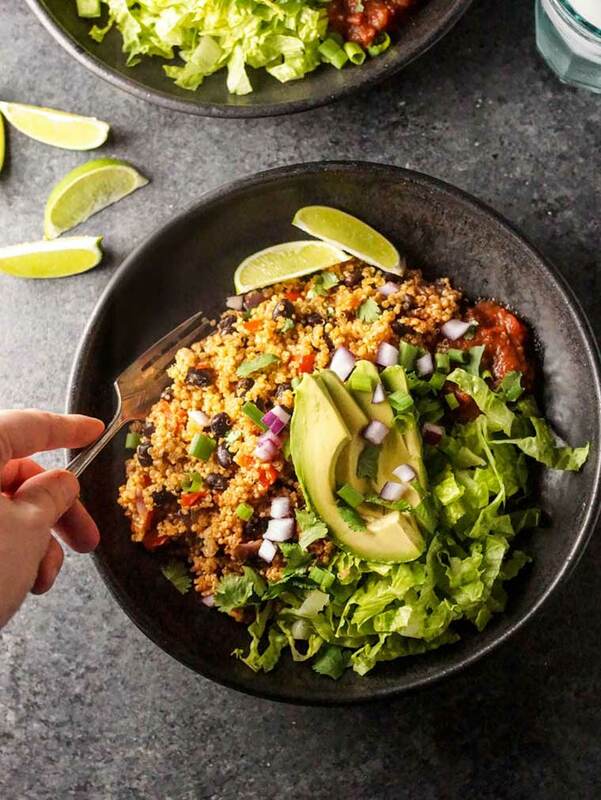 This quinoa burrito bowl only requires 8 basic staple ingredients and can be thrown together in just 5 minutes (plus the 20 minutes hands-off cooking by your Instant Pot). It’s loaded with fiber and protein, perfect for meal prepping as it can be prepared in larger quantities and enjoyed cold for your next lunches… and it’s so versatile. Optional toppings include avocado, guacamole, cilantro, green onions, leafy greens, salsa, and more! It’s these kinds of dishes that make you love your Instant Pot. The cauliflower curry recipe here is super simple, wholesome, and requires very little active time. Perfectly balanced, full of veggies, and a flavorsome handful of delicious spices… your kitchen will smell amazing while the Instant Pot does all of your cooking. Perfect recipe for those who are just starting to cook for themselves. 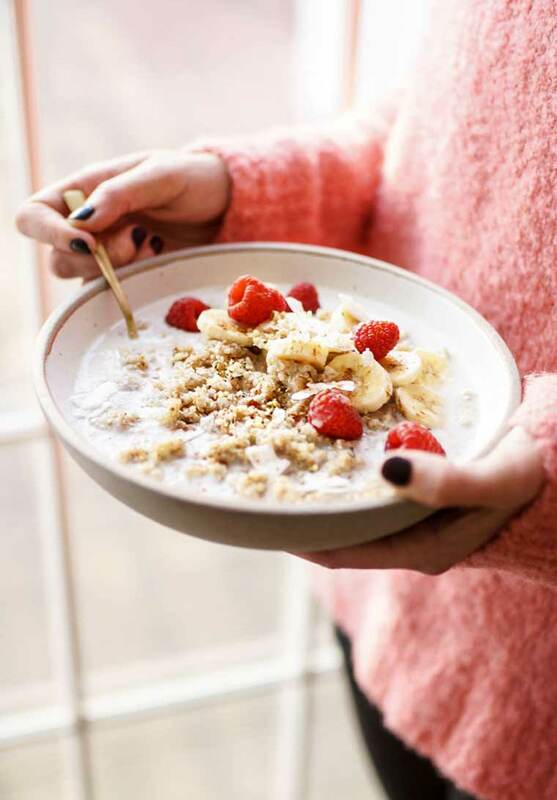 If you’re having oats for breakfast, you’re definitely one of us health nuts. But going steel-cut, you’re upping your game another notch! They do take longer to prepare than rolled oats (usually)… but that’s where the Instant Pot comes in. 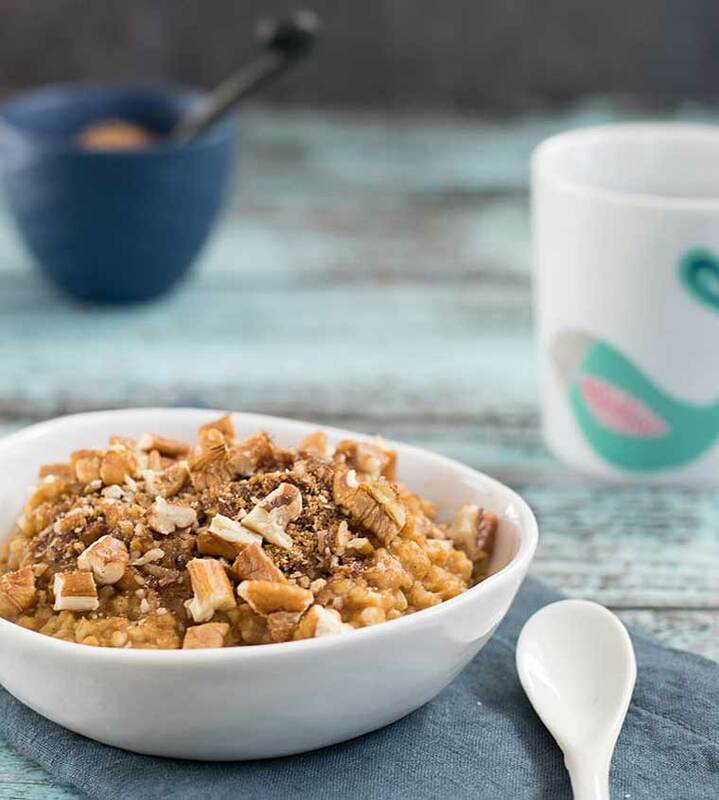 To get the chewier rice-pudding-like texture, you can put the steel cut oats along with some water or plant-based milk in your Instant Pot in the evening, set the timer, and have it cook you a fresh, delicious breakfast in the morning! Feel free to add all kinds of goodness from fresh fruit to nuts, seeds, coconut yogurt, and spices to the oats before eating. Yes, you read that right! Walnut and pumpkin in a delicious, comforting, and nutrient-dense chili. 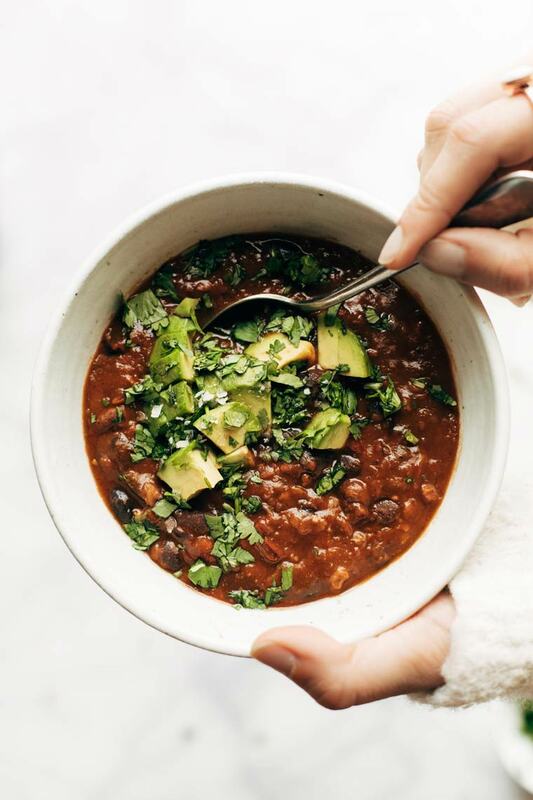 The goodness doesn’t stop here: red lentils, black beans, and bulgur alongside bell peppers, topped with avocado… running to the kitchen yet? This is going to taste so hearty and meaty, the whole family will be on board. Awesome choice for batch cooking and meal prepping, too! This traditional American meal can so easily be veganized, it’s ridiculous. 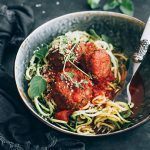 And you probably have most of these ingredients already in your pantry, because plant-based foods are oftentimes staples and super ordinary (against popular belief). It’s a perfect thing to serve to carnivores because they won’t believe you when you tell them there is no meat… Plant protein all the way here. This traditional Indian side dish takes just 1-2 minutes of pressurizing if you cook the potatoes using the “sauté” function before adding the cauliflower. Again, this is a pretty versatile recipe with lots of spices or veggies to use (up). We personally like to add some carrots or zucchini when on hand! Sweet potatoes or pumpkin work well, too. This recipe gives you a good insight into basic grain cooking functionalities of the Instant Pot. Add your quinoa along with the blended sauce into the pot, manually choose 5 minutes of cooking time, and walk away. Allow the pressure to release naturally, get your fluffy quinoa out when you want to eat it and top with some lime juice. This can even be made in advance, using the timer setting, while you’re picking up the kids or running some errands. Who doesn’t like potatoes? I mean, seriously. Mashed potatoes are loved by pretty much everyone – especially with some gravy on the side. This easy and creamy recipe is free from common allergens (soy, gluten, nuts) and can easily be made oil-free, too. The delicious herbs and spices take it to the next level but can also be swapped for your convenience. Our tip: add some nutritional yeast for a vitamin boost and cheesy flavor! Hasn’t the title convinced you, yet? This epic breakfast option makes a large pot of pumpkin oats which is perfect for weekly meal prep or even freezing for the next months! The recipe just takes 3 minutes of pressurizing in the Instant Pot and makes around 6 servings. We love the spices used here, definitely different from your usual oats! If you’re looking for a flavorful Indian dinner but cannot be bothered to go out, this is for you. Restaurant-style, irresistible, healthified, and way less complicated than it sounds. 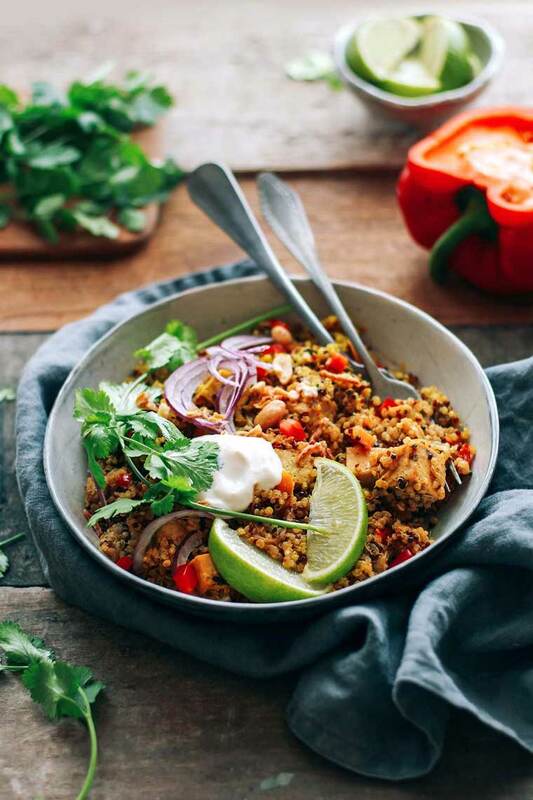 For simplicity or taste preferences, you could even skip the marinated tofu and just go for the quinoa biryani with caramelized onions and a nice load of plant-based yogurt to temper the Indian spices. Granted, this delicious and healthy treat calls for a bit of roasting in the oven on top of using the Instant Pot - but it was just too good and had to be included here. Because one of the most common questions we get is “what should I have as a snack?”… answer can be found here. This is how you’d add more whole plant-based foods like nuts, seeds, and even super healthy chickpeas into your diet. 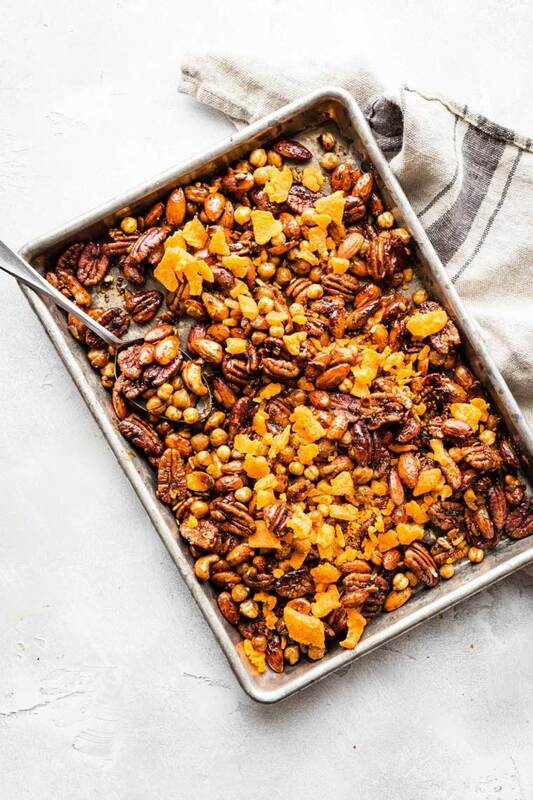 Just imagine what your kitchen will smell like when preparing this delicious trail mix at home! 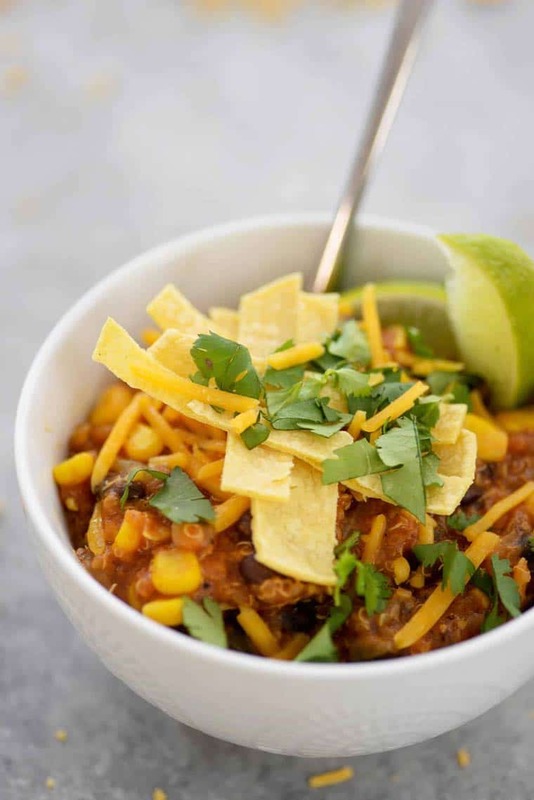 It’s true, one of the go-to meals for Instant Pot users are chilis – a perfect type of recipe to make with this kitchen tool. But have you tried this hearty version with sweet potatoes, kidney beans, tomatoes, cumin, maple syrup, and bourbon? Wowza. After a short sauté, you toss in all of the remaining ingredients and set the timer to 15 minutes. Come back later to a steaming, spicy dinner! 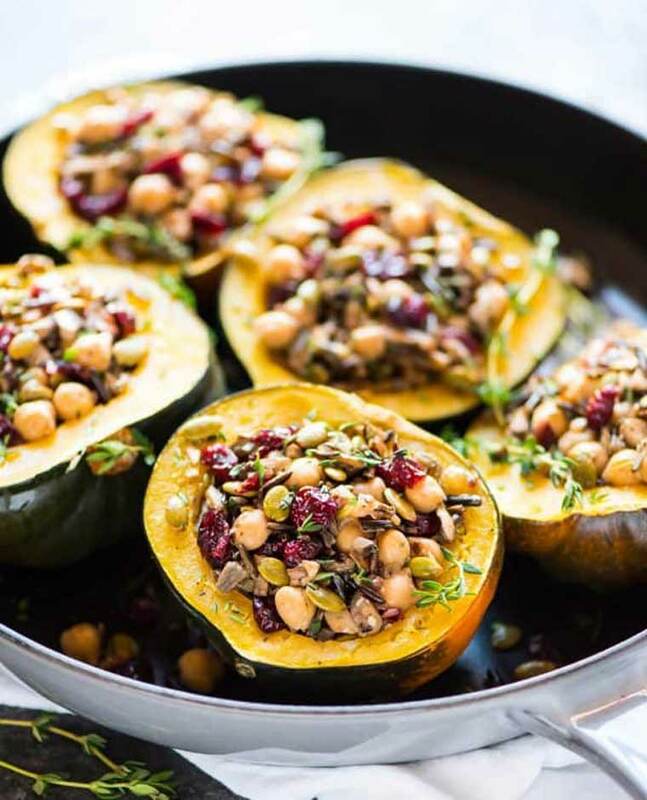 Instant Pot acorn squash! Don’t think this is possible? Turns out similar to when you bake it but all that is required is 4 minutes of pressure cooking. This recipe shows why it’s great to have 2 inner pots – one for making the filling (rice and/or beans), taking it out, then preparing the squash in the next one. Even though it’s kind of an end-of-the-year holiday meal, you could play around with the ingredients to make it occasion-appropriate for you. Can’t go wrong with squash, rice, and beans! Replacing dairy is one of the biggest struggles for someone trying to be vegan. Sure, soy milk, almond milk, oat milk… pretty much all available at your grocery stores. But vegan yogurt – not so much, probably. Or they are ridiculously expensive. So why not make your own with coconut milk? The Instant Pot Duo and all versions above that come with the awesome yogurt function for all vegans to have an endless amount of this goodness at home. 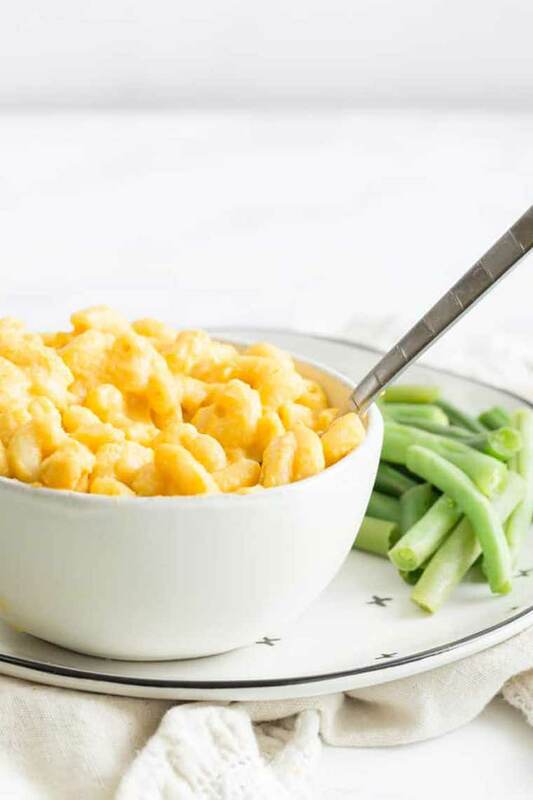 Get ready for the ultimate crowd-pleaser and comfort food! 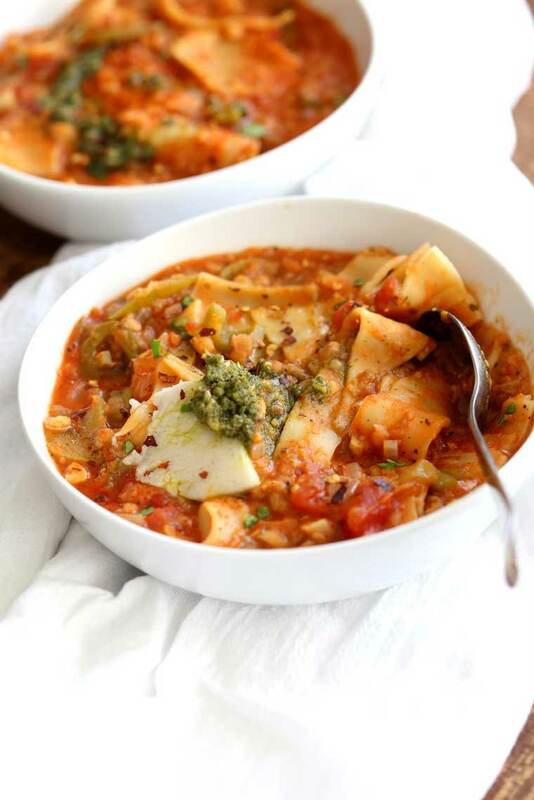 Vegan lasagna soup. I could pretty much end this caption here, but let’s add a few more words. Pasta, tomatoes, herbs, red lentils. Perhaps some pesto and garlic bread. How can you go wrong with this? Even if you don’t have an Instant Pot yet, make this – there’s a saucepan option, too. Takes a total of 30 minutes (with the IP), can be made with any pasta or swapped for a gluten-free grain, even. One of the more annoying things when making risotto is the constant stirring. 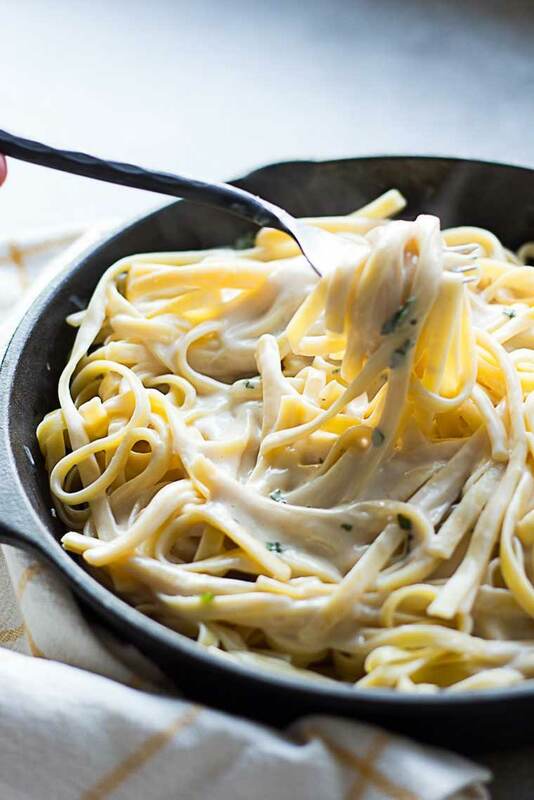 Don’t get us wrong, it’s overall a pretty easy recipe but if you’re looking for hands-off cooking, this Instant Pot version of the Italian classic will be perfect for you! By sautéing the onions, garlic, and thyme in the beginning, you will save some time because Instant Pot will be quicker to build up pressure. Once you put all of the remaining ingredients into the pot, set the timer to 6 minutes and keep yourself entertained until a distinct beeping will tell you that dinner is ready! A deliciously sweet and tart dessert or snack, this healthy goodness can be used in so many ways. Top your yogurt or oatmeal with it, use it as a salad dressing or egg replacement when baking, or serve over roasted veggies! If you’re not feeling the cranberries right now, swap for another fruit of choice or simply use an additional apple or two. Truth be told, the Instant Pot is just perfect for cozy, nourishing meals. Stews that remind you of cuddling up in front of a fireplace, under a mountain of blankets, with your cat. Or dog. And this lentil gumbo in your bowl! Filled with lots of protein, iron, folate, fiber, B vitamins, and tons of other great nutrients to keep you healthy throughout the year. It’s also very budget-friendly, and you could add whatever veggies and legumes you find in your kitchen to use up in place of the ones you find in the original recipe. This kind of breakfast really sets the tone for the whole day! It’s super nutrient-dense, naturally gluten-free and refined sugar free. It works super well for meal prep and breakfast-to-go! This recipe will bring you 6 jars of deliciousness. It calls for fresh fruit, even some veggies, omega-3 rich plant-based foods, and creamy coconut milk. Convinced yet? Go check it out. It’s got the flavor of enchiladas, but it’s also not enchiladas – still, a quick and comforting version that’s ready in just 25 minutes. You could even use the base for a filling, or just eat it straight out of the pot. Totally customizable! Top with some chopped corn tortillas and a few shreds of vegan cheese if you like. Eating your veggies couldn’t be more delicious! Most of the time, the Instant Pot is used for savory dishes, with the occasional sweet oatmeal or applesauce. 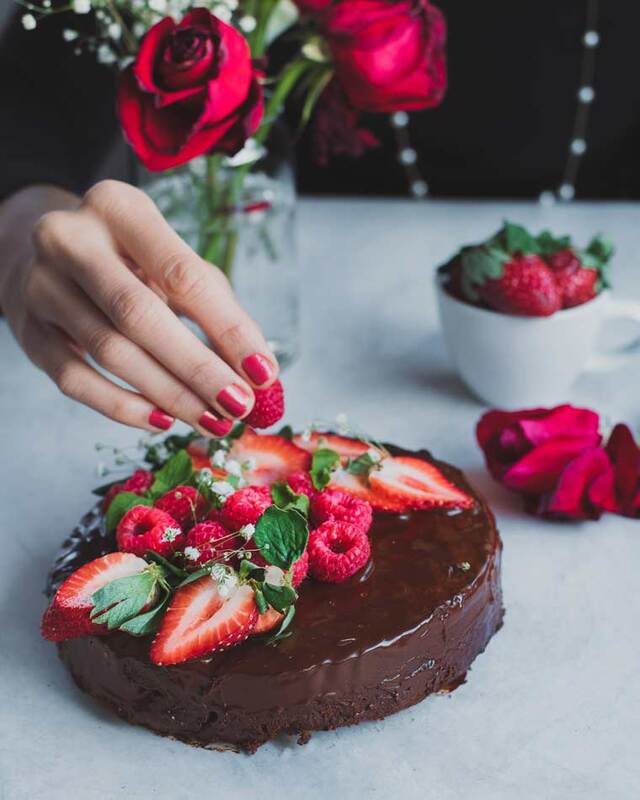 Until you find out about an Instant Post chocolate cake and decide that this is too magical to not try at least once. It doesn’t create a super-hot kitchen during summer, you don’t need to check the oven all the time, and the simple chocolate ganache just requires 2 ingredients. What you do need for the cake is a steamer basket and a springform pan, though – still, go for it. This isn’t your average recipe for a carrot soup – and not just because it was made in an Instant Pot. Thanks to the device, it will only need to be cooked under pressure for 5 minutes but from start to end, it’ll be more like 25 minutes. No checking required, though! The secret ingredients for a different type of carrot soup flavor are coconut milk and thyme as well as some lime juice. Definitely worth a try! 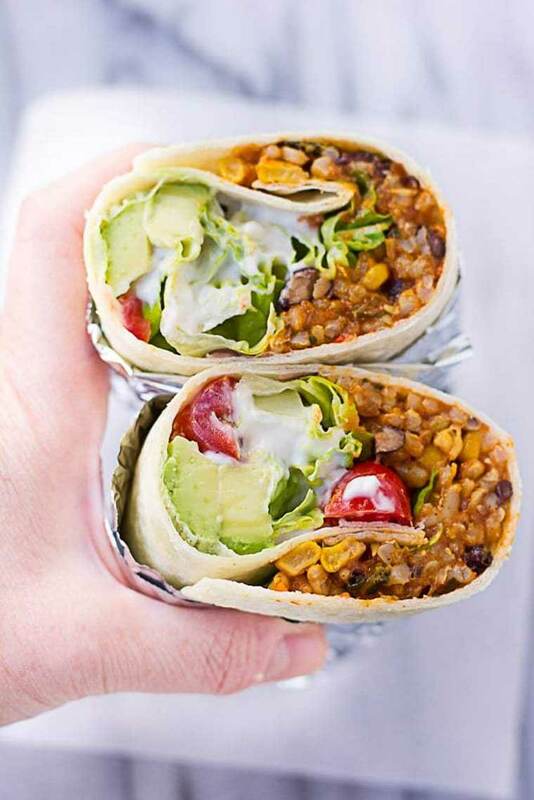 If you know us, there’s no questioning our love for all things beans – especially in the form of a burrito. When we go out to eat and there’s a bean burrito on the menu, we will order it. Period. That’s why we love our Instant Pot so much: it helps us make more Burritos, even faster. They suddenly become an easy weeknight dinner, letting the kitchen gadget cook the filling for 27 minutes (no monitoring required) while chopping up some greens and avocado. Assemble, done! The key to a sweet quinoa dish is to soak away the bitterness of this pseudo-grain, then rinse and cook. 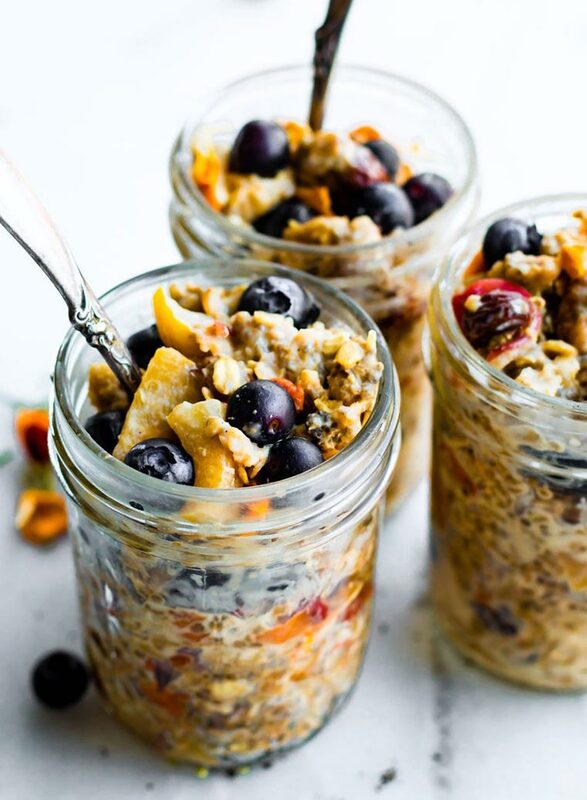 If you’re ever over oats for breakfast (we’re still not after many years! ), a creamy quinoa porridge might call your name. This one comes with a can of coconut milk, which you can swap for any plant-based milk if you’d like a lighter version. Super customizable as you add whatever toppings you have on hand after cooking it – think fruit, nuts, seeds, cacao nibs, or granola. Comfort foods that hide a few veggies? Count us in! 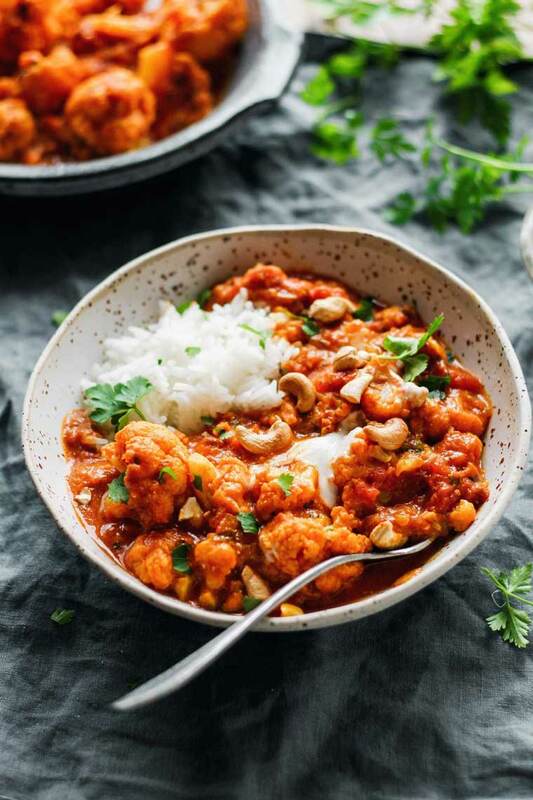 This chana malasa is super satisfying, only requires 15 minutes of prep time, and has a whole bunch of plant-based protein (for those of you how are concerned about not getting enough). The spice combination is just fantastic and will greatly entertain your mouth! Seriously, dinner won’t get much better than that. Another family favorite, for sure… having no time but lots of hungry bellies to feed? This is your go-to. Unlike the traditional version of this dish many might think of, this one is actually a healthy dinner while its taste is pretty close to the “real deal”. The best part is the hidden veggies in the sauce and that it’s rather low in fat. Go for whole grain pasta to make it even healthier like we did in our stovetop recipe for vegan mac'n'cheese. We love all things potato! Especially when baked. 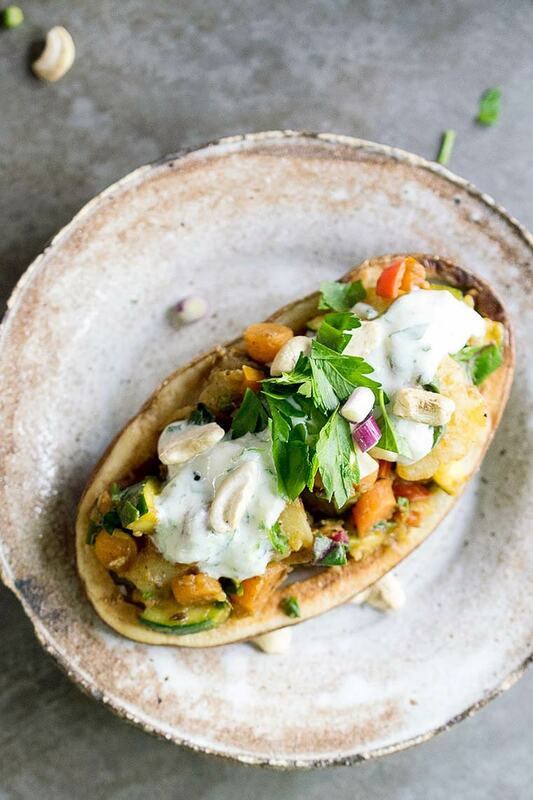 The vegetable curry that serves as a filling for the potato skins is made in just 5 minutes, using the Instant Pot. We love the comforting mix of spices: garam masala, cumin seeds, turmeric, mustard powder, and cinnamon. The dish has a perfect balance because of the fresh soy yogurt topping! Pasta dishes are just everyone's favorites, right? 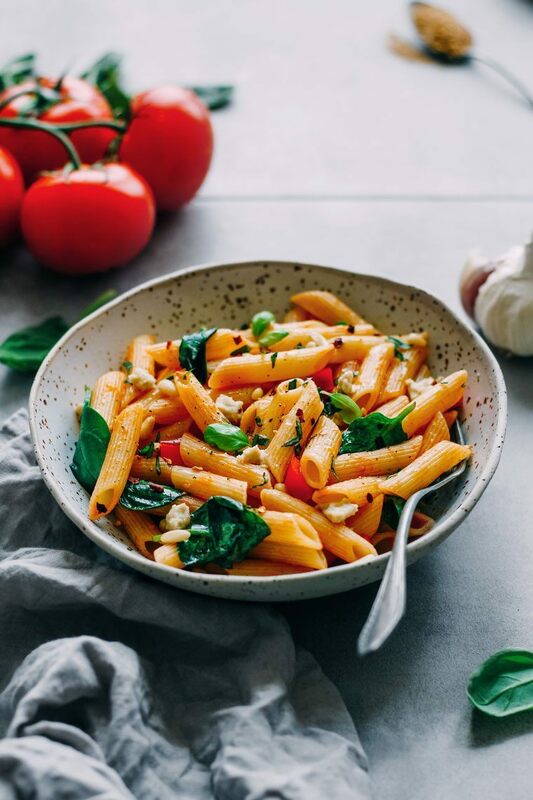 And if you're looking for a delicious way to sneak more veggies onto your and your family's plates, you need to try this colorful pasta marinara. The good news, apart from the hands-off cooking and being able to deal with other things while having your dinner cooked, is that you can really customize this recipe. Just use the veggies you already like or have on hand and throw them in with the rest of the ingredients, replacing by volume what you don't like as much. The Instant Pot really does make your life simpler. And recipes like that can prove it! This Middle Easter-inspired, protein-packed soup just requires 12 minutes of cook time – and it’s super flavorful and healthy, too. Feel free to customize it, using up the kinds of veggies you’ll find in your kitchen. Less than half an hour later, you will have 5 good portions of delicious soup. Perfect for weekly meal prepping, if you ask us! Do you also own an Instant Pot? Which types of meals do you usually prepare with it and which of these recipes will you try next? Let us know below! 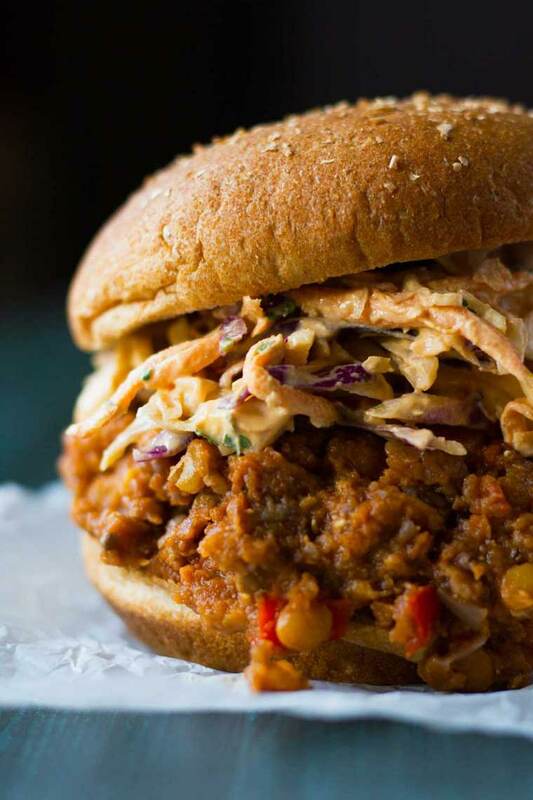 Thanks for sharing this delicious vegan recipes list with us. Our pleasure, thanks for stopping by! I have a multi-function rice cooker. 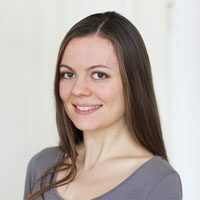 Can I use it to create these recipes? They look fabulous and fresh. Thank you for sharing them. rice cookers are also great for one-pot dishes, yes! But you will probably have to cook your ingredients for a longer period of time since it doesn’t work with pressure as the Instant Pot does. I have the 6 quart, multi function duo that you refer to at the top of this article and I love it. One of my favorite recipes uses Butler Soy Curls, (that have a chicken-like texture when soaked and take on the flavors of everything in your recipe.) These can be purchased directly from the Butler website or at Amazon. I like the Soy Curl Noodle Soup recipe that can be made on the saute setting. Combine 1 onion, chopped, 1 large carrot, chopped, one stalk of celery, chopped, a package of mushrooms, 1 cup of soy curls, 8 tsp of Better Than Bouillon No Chicken Broth and 8 C of water. Bring to a boil on Saute. 2 tsp. tamari, 1 tsp. ground mustard, 2 tsp. of curry and a couple of handfuls of spinach. Put on the lid, but don’t seal it. Turn off saute and let sit for about 5 minutes. This truly is my go-to recipe and often takes on different flavors with what I add from my vegetable drawer.